The Depository Trust & Clearing Corporation (DTCC) played host for the annual two-day Customer Account Transfer (CAT) Seminar, sponsored by the Securities Industry and Financial Markets Association (SIFMA). The event, held at DTCC’s Tampa office, brought together 70 attendees, representing more than 25 broker/dealers, banks, mutual fund companies and service providers, to discuss current events in the transfer industry, including key updates on DTCC, CAT membership, best practices and regulatory changes. But the dominant topic of discussion at the event centered on modernizing DTCC’s Automated Customer Account Transfer Service (ACATS) and the industry efforts to shorten the ACATS cycle. The financial industry is in the middle of a revolution with new technologies, albeit at various stages of maturity, creating a whole new toolbox from which to work. DTCC Product Management and Application Development (AD) led sessions on how DTCC is modernizing the ACATS application, which includes a move away from legacy Cobol/mainframe to the cloud. Gordie Sands, Co-lead, Office of Fintech Strategy, led a one-hour session during which he shared DTCC’s role in exploring fintech innovations, including blockchain and artificial intelligence, and how that technology relates to modernizing the ACATS system. Participants of this year’s CAT Seminar began to think about what this could potentially mean for the ACATS system in the future. 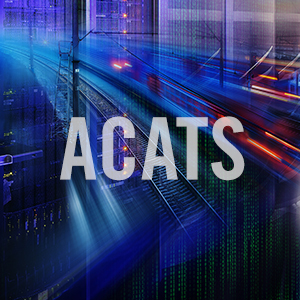 The effort to bring ACATS into the future is already underway, with a complete update to the underlying technology and industry requested enhancements targeted for completed by Q1 2019. Currently, the ACATS transfer process can take up to five days. The industry has begun discussion on what a desired end state in the future would look like. While a desired end state shared by most at the seminar is real-time processing and a transfer to occur in as little two days, the reality is there are barriers that need to be addressed to achieve this goal. DTCC, as mentioned in the seminar, will play a lead role in working with industry to work toward that goal. This year’s event also included interactive features like live, interactive polling, text feedback, panel discussions, and breakout sessions on important industry topics. By incorporating these more collaborative components every participant’s thoughts and opinions, which are extremely valuable given the breadth of collective knowledge shared by attendees, could be take into account. While DTCC is leading the effort to modernize ACATS, moving forward does require collaboration and commitment from the entire industry and this was achieved at the 2017 CAT Seminar.